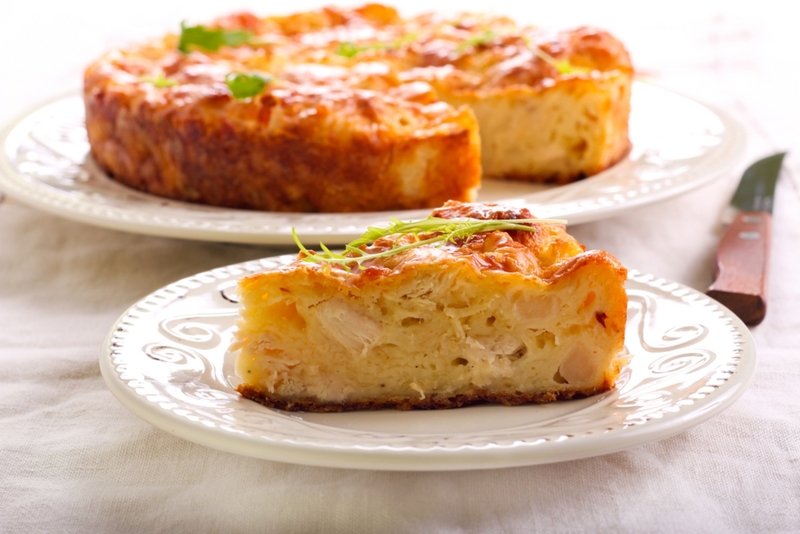 Breakfast, brunch, lunch or dinner – anytime is a great time for quiche! This tasty, no-crust recipe makes for an easy meal and is a most excellent go-to recipe for afternoon entertaining – plus, it reheats well, so it’s an excellent snack to have on hand for the kids. We’ll just let them continue thinking they’re getting away with something, when really we’re stealthily packing their growing bodies full of protein and vegetables! (Cue the evil villain laughter.) We love that this recipe can be adapted to whatever happens to be in the fridge or garden, as well as the no-fuss addition of already cooked rotisserie chicken. Just a quick stop off at the store on the way home from work and you’re off and running! You won’t be sorry you whipped up this delicious little treat! Preheat oven to 375º F and grease a 9 inch springform pan. Heat olive oil a small skillet on medium heat. Add onion and saute until tender, then stir in garlic and cook for 1-2 minutes more. Remove from heat and set aside. In a large bowl, whisk together eggs, cream, salt and pepper. Stir in chicken, cauliflower, onion and 1 1/4 cups cheddar cheese. Transfer to the oven and bake for 35-45 minutes, (until a knife inserted in the center comes out clean), then sprinkle remaining cheddar cheese over the top and bake for 2-3 more minutes more. Remove from oven and let cool for 5-10 minutes, then loosen quiche from the sides by running a thin spatula around the inside rim. Carefully remove the ring and transfer quiche (with bottom base of pan) to a serving plate. Garnish with arugula (optional) and enjoy!